Near this old bridge, spring never ends. If you incorporate this mosaic art into your bedroom, this quiet corner will be the first thing you’ll see as you open our eyes. 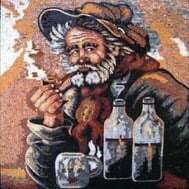 PROs: Handmade tile mosaic art composed of high-end natural marble that is guaranteed to transform your space. Mosaicist: Haith D.
CONs: May spark disputes on how bridges have changed the world.